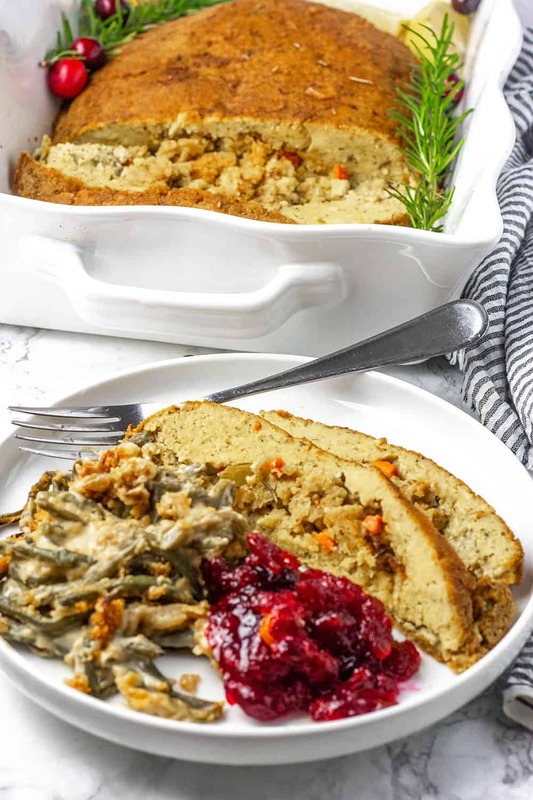 This is the best Vegan and Gluten-Free Tofu Turkey! 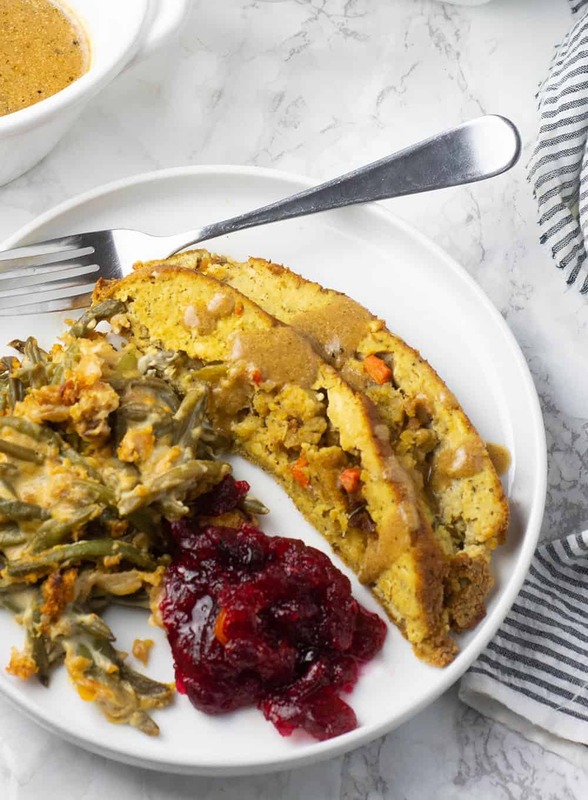 It is so flavorful, tofu is seasoned with herbs and spices, stuffed with cornbread stuffing, marinated and baked to perfection. 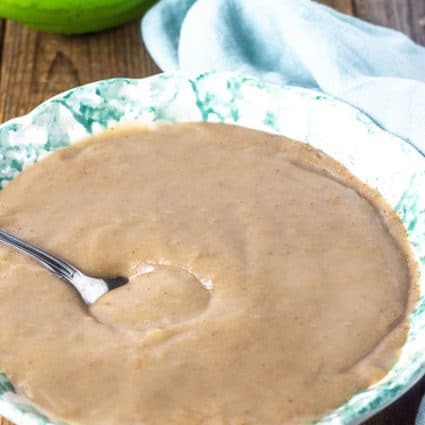 Ever since a reader asked what replacement could one have for Tofurky that is gluten-free and vegan, I have been experimenting on this recipe and I'm happy to finally share it with my readers in time for Thanksgiving. 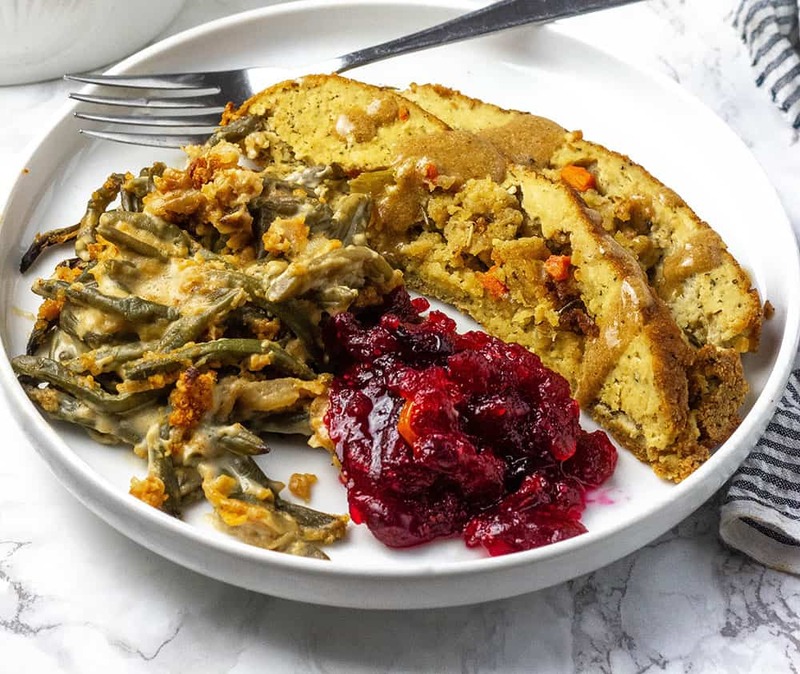 I already have outstanding holiday recipes for Lentil Loaf, Lentil Meat Balls and Smothered Tofu Chicken that would be perfect to be the main dishes at any Thanksgiving table but I needed one to replace Tofurky. My Tofu Turkey recipe was a huge hit with my family members, especially my son Daevyd. Tofu turkey is a meat substitute shaped in the form of a loaf that at times has a seasoned stuffing in the center. It is usually made from a combination of tofu and gluten. It is usually sold in health food stores in the refrigerated and frozen sections. 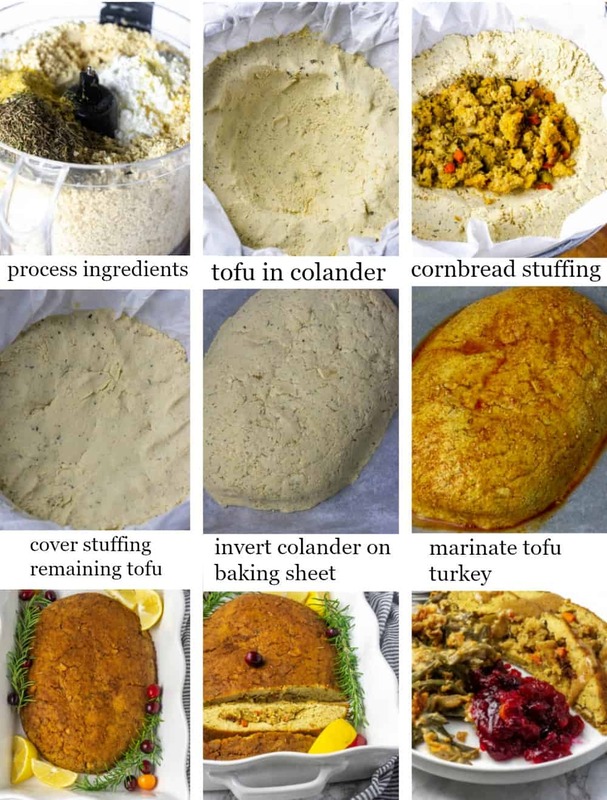 How To Make Tofu Turkey? 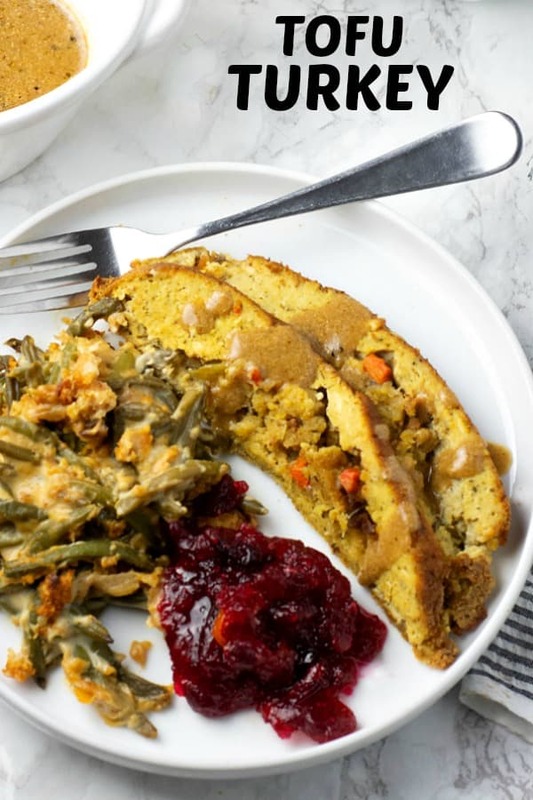 Make a batch of Cornbread Stuffing, make your own or use store-bought. Set aside. Make the marinade and set aside. Add tofu in a large bowl, mix with seasonings. After chilling, tofu, remove the middle of the tofu to form a hole and about an inch of tofu remaining at the base and sides, reserve the scooped out tofu. Place stuffing in the center of the hollowed out tofu and cover the stuffing with the remaining tofu, pressing down with the palm of your hands. Baste tofu with the marinade. Invert tofu onto a baking sheet and form tofu in an oval shape. Baste the top and sides of tofu with the marinade. 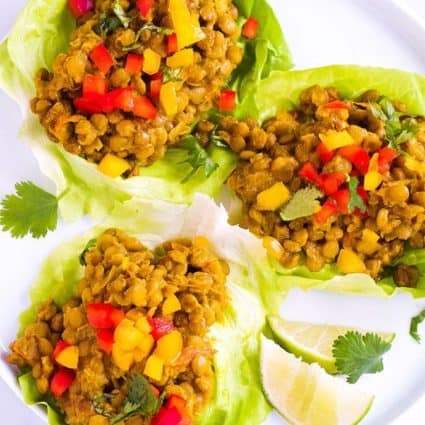 Cover tofu with parchment paper, foil, and bake in a preheated oven at 400 degrees for 1 hour, basting every 30 minutes. Remove cover after 1 hour and bake for 30 minutes until golden brown. 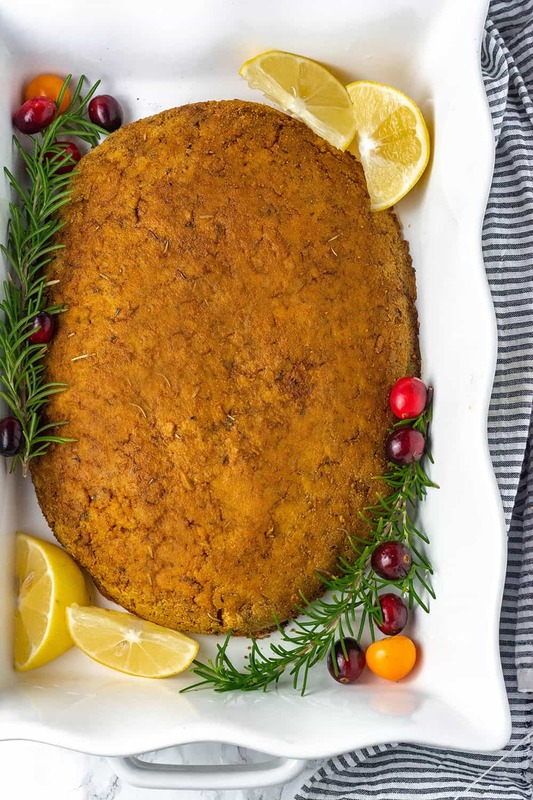 Remove tofu turkey and transfer onto a serving platter, garnish with rosemary and cranberries. Tofu Turkey is delicious served with my Gravy, Green Bean Casserole, Mashed Potatoes, Cranberry Sauce, Sweet Potato Casserole. 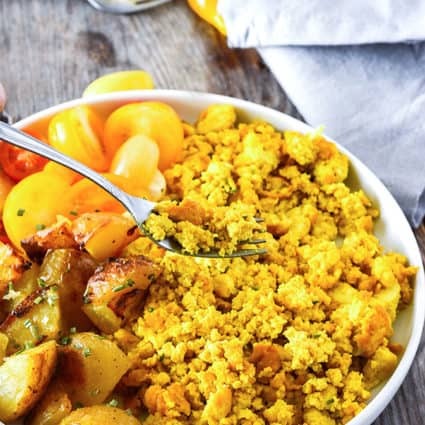 It is best to use Super Firm Tofu, Trader Joes and Wildwood brands have superfirm tofu. The final texture although its firm it is not exactly like gluten roast but it is the best gluten-free vegan texture that's homemade. 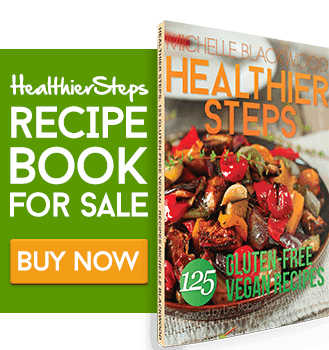 If you make this homemade tofu turkey recipe snap a photo and hashtag #healthiersteps — we love to see your recipes on Instagram, Facebook & Twitter! Place tofu in a food processor and process until fine Add tofu in a large bowl, mix with seasonings. If using extra-firm tofu, place a cheesecloth or thin towel (I used parchment paper) inside a colander, add tofu. Cover tofu with cheesecloth or thin towel and then add weights on top of the cloth. Place colander on a place and refrigerate for 2 hours. Skip this step if you are using Super Firm Tofu. After chilling tofu, remove the middle of the tofu to form a hole and about an inch of tofu remaining at the base and sides, reserve the scooped out tofu. Place stuffing in the center of the hollowed out tofu and cover the stuffing with the remaining tofu, pressing down with the palm of your hands. Baste the top and sides of tofu with the marinade. Cover tofu with parchment paper, foil, and bake in a preheated oven at 400 degrees for 1 hour, basting every 30 minutes. Remove cover after 1 hour and bake for 30 minutes until golden brown skin crispy. OMG this looks sooo good! I wish you had a video tho. I feel like I need to see steps 4-6. 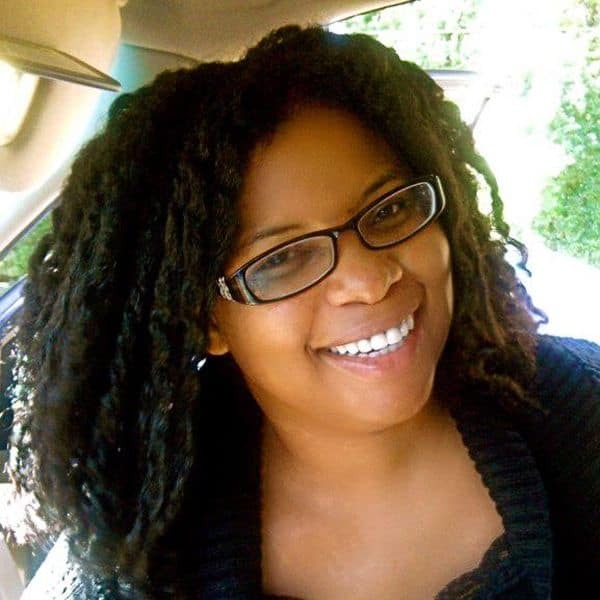 But on a s/n… I’m so happy I stumbled upon your page too! Thank you Tanesha, you are so right. I will make it again soon to include more steps with the photos or do a video. I appreciate your feedback.